I was coaching my son's travel baseball team all day today, but I was excited when I got home in time to pick up the game in the fourth inning. After watching for a bit though, I wish I hadn't. What a disaster! The Sox took the early lead but David Price was awful, giving up six runs in 5.2 innings and walking four while only striking out five. For the first five innings, the Sox and Rays traded runs and were deadlocked at five heading into the sixth. It was the sixth when the wheels fell off the cart. After giving up a run in the sixth, seventh, and eighth innings, Red Sox reliever Brian Johnson pitched an abysmal ninth inning, giving up four runs and putting the game completely out of reach. The final score was 12-6 and in dropping the first two games against the Rays, the Sox have lost this series. It seems that, regardless of what the Rays' record is in any season, they're always a tough matchup for the Red Sox. This season is no exception, but the bigger concern is that the pitching has not looked good lately. Chris Sale hasn't been sharp for his last two starts, Drew Pomeranz appeared to not be back to full strength, and David Price is still much too inconsistent. I'm also a little tired of these strange lineups Alex Cora has been putting out lately. I'm by no means souring on him or the job he's doing as manager, but it does seem like he's been putting out some very strange lineups over the last several games. I'm very old school when it comes to baseball and prefer set lineups and batting orders that only vary slightly once in a while over the course of a season. I know that the game and the approach to it has changed and that my mentality is probably seen as anachronistic, but I do think a stable lineup where players know who is going to be playing and where is good for team chemistry. In the meantime, I really hope the team can get on track and back in the win column to finish this series. The Yankees are playing really well right now and closing in on the Sox; with a series in the Bronx looming next week, now is the time to keep them at bay or, if possible, put a little more distance between them. I finally had a night off this week: no practices or games to coach after work, just relaxing and visiting with my in-laws who are in town for a few days. We went out for an early dinner with then and when we got back, I was able sit on the couch and put the Sox game. I picked it up at the beginning of the third inning but unfortunately, by that point the Sox were already down 2-0. I saw Rob Refsnyder hit a solo home run to put the Rays up 3-0 and then Daniel Robertson hit another solo homer in the fourth to give Tampa a 4-0 lead. Drew Pomeranz looked awful tonight...he gave up three home runs (the two solo shots and a two-run homer in the first) and nibbled around the plate all night. He only slogged through five innings, striking out four and walking two and never looked sharp or comfortable. More ominously, toward the end of his final inning he seemed to grab his side in pain and rubbed it with a slight grimace. It's looking like he may not have a season like he did last year and I hope he can turn it around because this team needs him in the rotation. I'll be watching to see how the rest of the year pans out for him. The Red Sox were being no-hit by Rays starter Blake Snell into the fifth inning until Xander Bogaerts, back from his foot injury, slapped a single up the middle to break it up. The Sox finally got on the board in the sixth with a trio of triples from Christian Vazquez, Mookie Betts (driving Vazquez in) and JD Martinez (driving Mookie in). JD knocked another RBI in the eighth but it was too little, too late as the Red Sox dropped this opening game of their short home stand 4-3. It was a case of good pitching from Tampa and poor pitching from Pomeranz that put the Sox in a 4-0 hole they just couldn't dig out of. We got another bizarre lineup from Cora, too, with Benintendi sitting and JD playing left field, Tzu-Wei Lin at second, Eduardo Nunez at third, and Mitch Moreland at first. I still don't like seeing JD in the field...his defense is awful and I'd like to see Benintendi play not only for his glove but to get more at-bats so he can break out of his slump. I really hope the long-term plan is to install Martinez as the regular DH because it seems stupid to me to break up the best defensive outfield in the league when there are other ways to get his bat into the lineup. I'm thinking (hoping) this is just a case of Cora tinkering early in the season until he settles on something that works. More immediately pressing, they need to figure out what to do with Pomeranz soon because if he's still hurt, they need to shut him down until he's back to full strength and get Velazquez back in the rotation. With the Yankees heating up and Toronto still lingering in the standings, this is not the time to start dropping games and letting those teams get closer to the division lead. I've got a full weekend of coaching travel baseball but I will be watching to see if the Sox can bounce back after this dud. You know what's a good sign? That on a night when Chris Sale didn't have his best stuff, the Red Sox still managed to scratch and claw and fight their way to a win. I coached two hours of travel baseball practice and my youngest daughter's softball game so I got home to watch in the fifth inning right after JD Martinez belted a three-run homer to give the Red Sox a 5-3 lead. Prior to that, they had been playing catch up all night, falling behind 2-0 by the end of the second inning before Andrew Benintendi drove in the Sox first run. After the Jays got another run to go up 3-1 in the third, Rafael Devers drove in a run in the fourth to cut it to 3-2 before JD hit his home run in the fifth. From there, the Sox pitching would clamp down on the Jays and, apart from giving up a run in the seventh, they held on to win 5-4. The big home run from Martinez was very timely and nice to see...that's something we wouldn't have seen last season with the power outage the Sox suffered from in the wake of David Ortiz' retirement. Even better was the fact that on a night when Chris Sale wasn't particularly sharp (six innings, four strikeouts, two walks, three earned runs) the Red Sox were still able to fight back and get the win. Carson Smith came on in the seventh and promptly gave up two hits and a run and to my eyes, looked awful. He nibbled around the edges of the plate and didn't scare any of the Blue Jays hitters with his stuff. I've not been a fan of his all season and it baffles me why Cora continues to send him out there. As I've been saying all season, middle relief continues to be the Sox Achilles heel and that was shown once again in this game. Another one of the Red Sox "hold-your-breath-and-cover-your-eyes" middle relievers, Matt Barnes came in after Smith and actually pitched really well. While he did walk two, he didn't give up any hits and struck out three, including one on a nasty slider. Craig Kimbrel came in for the ninth and picked up the easy save, striking out one and inducing two pop ups. One last thing I want to bring up yet again is another mention of how bad the Red Sox are on the base paths. The culprit in this game was Benintendi, who was picked off in ugly fashion. As much as I love the guy, for someone with his speed he's an awful base runner when it comes to decision making and running into outs. The team as a whole has suffered from this affliction the last few seasons and while it used to be blamed on former third base coach Brian Butterfield, we now know it's a systemic issue since Butterfield was let go after 2017. Heck, for my fellow Red Sox fans who go back a long time, I'm sure we all still remember "Wave 'Em In" Wendell Kim! I understand being aggressive on the bases, but you also have to be smart and far too often, the Sox run into outs or kill rallies with poor choices (case in point, the other night when Carlos Febles sent Eduardo Nunez home on a play that wasn't even close). If the Sox can somehow tighten that up, they'd score even more run. It's something to watch over the rest of the season to see if it improves or if it ends up continuing to be an issue. Mookie Betts. What else do I have to say? For the third time this season, Mookie led off the top of the first inning and launched a solo home run into the stands to give the Sox an early 1-0 lead. The Jays would tie it up quickly in the bottom of the inning, but Brock Holt gave the Sox the lead back with his RBI double in the fifth inning. After giving up a run in the fifth and again in the sixth, the Blue Jays were back on top and it was starting to look like a repeat of the previous night where the Sox clawed their way back before giving the lead right back. However, the man who started it all for the Sox came through in the top of the seventh, belting a two-run homer to give the Sox a 4-3 lead which they held on to for the win. Eduardo Rodriguez ran his record to 3-0 by pitching 6.2 innings with three strikeouts and a walk, although he did give up those three earned runs. It wasn't the greatest pitching line by any stretch, but it got the job done. Heath Hembree and Joe Kelly combined to keep the Jays off the board after Rodriguez left and Craig Kimbrel atoned for his blown save the previous night by picking up this one. With the win, the Sox end their three-game skid and head into the series finale with Chris Sale on the mound. There's also been some rumors that Xander Bogaerts may be back after the weekend. If that's the case, this lineup should get even better once he's back into his rhythm. As for Mookie, what can you say? Two of my daughters had softball games last night (and I was coaching one of them), so I missed most of the game but I was getting all of the updates and highlights on my phone. When Mookie hit his first home run, I was excited but when he hit the second one I just shook my head. He's just an absolute pleasure to watch and root for and he's truly a five-tool player. It's not just his hitting that is so special, but his fielding and everything else he does. In 2016, Mookie and Mike Trout ran neck and neck all season in the MVP race and while Trout deserved to win it, so did Mookie. Both had down years last year (Trout due to injury, Mookie just slumped a bit), but both look to be rebounding very strongly in 2018. I'm hoping Mookie can keep it going all season because if he can, it will be a huge lift for the Sox as they fight off the Yankees for the division. The Red Sox hit Toronto on Tuesday to begin a three game series with the Blue Jays hoping to halt their two-game skid from Oakland. The Jays started off the season strong but had just lost three of four to the Yankees heading into this series so they seemed ripe for the picking. Unfortunately, the Red Sox couldn't take advantage of that. Rick Porcello brought his flawless record to the game but gave up three runs in the second inning that really put the Sox in a hole and would ultimately cost them. For the rest of the game, he was fantastic, striking out nine over seven innings. A Hanley Ramirez RBI in the sixth got the Sox on the board and in the ninth they scored two on RBI singles from Eduarado Nunez and Brock Holt to tie it at three. However, bad base running, which continues to plague the Red Sox, reared its head as Nunez and his balky knee were sent from third base where he was tagged out erasing the possible winning run. It came back to haunt them as in the tenth inning, Craig Kimbrel gave up a solo home run to Curtis Granderson which gave the Blue Jays a 4-3 win. With a 17-5 record, it's certainly still a great start to the season for the Red Sox, but the sudden lack of production at the plate over the last three games is starting to be a little cause for concern. While the team isn't going to be as good over the course of the entire season as they were in the first month, they're also not going to look as bad as they have the last few games. With as young as this team is, their best players have been around long enough to also qualify as being "veteran" so I'm sure this is little more than an early season bump in the road for them. I'm more interested in seeing how Alex Cora handles this first challenge in his young managerial career. Given how the first month of the season has gone, I'm confident he'll right the ship quickly. Game two of this series is as good a place as any to start! Well, the Red Sox have another streak going...unfortunately now it's going in the opposite direction of the previous one! The team dropped their second straight game and their first series of the season to the lowly A's with a 4-1 loss on Sunday afternoon. I only had a chance to watch the ninth inning because I was busy coaching my son's travel baseball team in their doubleheader all afternoon. What little I saw seemed to mirror what happened over the last two games in Oakland...the offense suddenly went quiet. The Sox didn't get their lone run until the top of the seventh. Starter David Price pitched 7.2 innings, striking out six and only walking one. Heading into the eighth he'd only given up one run and the game was tied, but a three run home run he surrendered to Khris Davis put Oakland up by three and would prove to be the difference. Cora also went with a very unusual line-up, one that included moving Jackie Bradley to right field, Andrew Benintendi to center field, and JD Martinez to left field. While I understand the need to give Mookie Betts a day off, moving Jackie out of center makes no sense to me given his stellar defense there, nor does putting JD in left given his atrocious defense. I personally would've left Jackie in center, Benintendi in left, and hidden JD in right, but what do I know? The batting order was also unusual, with Bradley leading off. Whether it was a result of this strange line-up or whether it was just an off day, the offense couldn't get anything going. With an day off for travel Monday, the Sox head to Toronto to being a series Tuesday with the Blue Jays who have had a surprisingly good start to their season. The Jays always play the Sox tough so it will be another early season test for this team. I'm hoping for a bounce back after the disappointing end to the west coast trip. Some winning momentum would be nice heading into their mini home stand at the end of the month because after that is another extended road trip with some tough series against the Yankees and Blue Jays. It's time to see how good these Red Sox really are. Well, now we know what it takes to slow this Red Sox team down...a no-hitter! One day shy of being exactly twenty-five years since they were last no-hit, the Red Sox couldn't muster a single hit against A's pitcher Sean Manea and only got on base twice via walks. On a night against this frankly poor A's roster and with Chris Sale pitching, surely no one saw this coming. Sale went seven innings and struck out ten but gave up three runs early in the game. Manea, however, went the distance, also striking out ten with only the two walks keeping him from a perfect game. There's really not much to say about this game other than a tip of the cap to Manea for his performance and wondering how and why the Sox bats suddenly fell so silent. When I think about it, it's remarkable that a team as talented and playing as well as the Red Sox were actually no-hit to snap their eight game winning streak. That's baseball for you...such a quirky game that something extraordinary like this can happen to a great team in the middle of a crazy run of success. I'm interested now to see how they respond in the series finale! I finally managed to stay up for an entire west coast game this season...good thing it was a Friday night! Even so, I coached my son's baseball team for two hours after work before getting home and settling in for the night so I was already pretty tired when it started. I was very interested in seeing how Drew Pomeranz would do in his first start back off the DL. Unfortunately, he gave up three runs in the bottom of the first and the Red Sox were inexplicably in a 3-0 hole. It says something about this season that an early deficit felt strange. Drew really labored to get through only four innings, but after the first he settled in nicely and ended up striking out seven by the time he was lifted. Even during his fantastic 2017 season, he always labored to get through innings and had high pitch counts by the fifth or sixth innings. Last night he was unfortunately hurt by passed ball on a third strike that kept the first inning alive and led to the A's runs. Luckily for Drew and the Sox, the offense was there to bail him out and get them back in the game. A three-run home run by Jackie Bradley tied the game in the second and Mitch Moreland hit a grand slam on the first pitch he saw from A's reliever Emilio Pagan in the sixth inning. The team has now hit FIVE grand slams this season so far...after hitting ZERO last season. That was all the Sox would need as the bullpen kept the A's off the board and the Sox cruised to their eighth straight win with a 7-3 victory. That pushes their record on the season to 17-2 which is absolutely remarkable. With Chris Sale and David Price pitching the next two games of the series, the streak should continue as long as the bats remain hot. I had to be up the next morning to coach my youngest daughter's team at 9am so maybe it wasn't the smartest idea to stay up until almost 1:30am to watch the whole game, but this team is so fun to watch that I couldn't help myself. It seems like whenever one player is slumping or taking a night off, someone else steps up to contribute. The line-up is basically the same as last year apart from the addition of JD Martinez, but somehow it feels like it's a deeper, more dangerous roster both at the plate and on the mound. Every day I look forward to watching the next game and seeing what else they do to make me shake my head in disbelief. I know it won't last all season and that they'll come back down to earth, but I still think this is a really, really good team that can make a run at 100 wins and the World Series. Brett Anderson's new memoir Coal Black Mornings is a book I've been looking forward to reading since I first heard about it over a year ago. As one of the most interesting, cerebral, talented, and mysterious musicians of his generation, I assumed this would be a book worth checking out. Brett's distinctive vocals and lyrics have defined the sound of Suede and British rock music for over twenty-five years. The band are currently enjoying a late-career resurgence after reforming almost a decade ago and as part of the process of maturing in their music, Brett also seems to have taken stock of his life now that he's fifty years old, married, and a father. 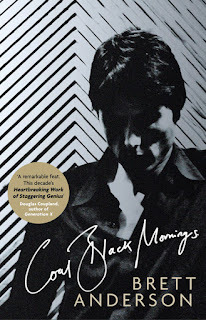 Inspired by the complicated relationship he had with his eccentric father and wanting to document what his pre-fame life was in order that his children would have the record of their father's life that he himself didn't, Coal Black Mornings emerged. Interestingly, Brett states quite clearly at the beginning of the book that his story will end right when Suede is starting to take off and become famous. Stating that he has no desire for the usual "cocaine and gold records" type of musician memoir, he wanted to limit it to his formative years and the people and places from that era of his life; his reasoning is that information about what came after can already be found elsewhere (including the excellent authorized Suede biography which I've reviewed). The book is devoid of any photographs or images of any kind apart from the front cover and a shot of Brett in a brief "about the author" blurb on the back inner jacket fold. It's as stark and free from artifice as Brett prefaced, but in a way it's all the better for it. Beginning with his birth after the "first Summer of Love," Brett details his life growing up in an eccentric and poor upbringing in a council house in Lindfield, on the edge of Haywards Heath. The picture he paints is of a childhood where from the earliest age, he and his older sister knew they were outsiders and were reminded of it every day. Their father Peter was an eccentric, moody man who drifted from menial job to menial job and was an obsessive fan of classical music (especially Liszt). Their mother Sandra was a creative free-spirit who made everything from the families clothes to furniture and even their meals from second-hand bits and pieces the family scavenged or found at thrift stores or rubbish bins. Brett was a quiet and relatively sullen kid who gravitated to the types of music and literature that resonated with his feeling of "outsiderdom." In the reverse of how most of his musical peers of the 1990s came to be musically educated, he first fell in love with the punk and new wave of the late 1970s and early 1980s before then working his way backwards to the Beatles, Who, Kinks, Led Zeppelin, and of course his eventual hero David Bowie. Brett also details his school years, with some degree of indifference if not a slight bit of fondness, from primary school through to when he left home to attend university. First heading to Manchester before transferring down to London, Brett began the seeds of what would eventually become Suede with his childhood friend Mat Osman and his new girlfriend Justine Frischmann. While the years growing up are fascinating in learning about his impoverished childhood, the strange dynamic of his home life and his parents' marriage, and how Brett looks back on his family, for fans of Suede it's the university years where the story gets even more interesting. While he stays true to his promise of cutting off the story right at the moment where Suede become famous and release their first single, he doesn't shy away at all from detailing their story from their embryonic formation to the very cusp of signing their record deal. Beginning with the first musical fumblings with Mat and Justine in their flats, it's when Bernard Butler enters the picture that I really couldn't get enough of what he had to say. The Anderson/Butler partnership has long been one of my favorite and in my opinion, is one of the greatest songwriting teams of not only the 1990s but of all time. I maintain to this day that virtually everything Brett and Bernard wrote and released in their all too brief time together in Suede was perfect. However, as discussed in the authorized Suede biography, Bernard was the one person who would not open up about his time in the band or his partnership with Brett. While the others talked about it in that book, they never got too in depth. Luckily for us, in Coal Black Mornings Brett talks openly and candidly about his relationship with Bernard, both as he felt then as well as with twenty-five years of hindsight and maturity. Describing his initial impressions and interactions, how their friendship and working partnership grew, and what it means to him now was some of the best stuff I've been able to read about Suede. Add in his pulling back the curtain, ever so slightly, into their songwriting process and inspirations and this was the most exciting part of the book by far. Along with the excitement of Suede's birth, however, Brett also takes time to discuss his parents divorcing when he was away at university, the heartbreak of losing his mother to cancer suddenly as a young man, and the complicated relationship with his father that lasted well into adulthood. It wasn't until his father passed away when Brett was in his late thirties that he was able to reconcile the love, confusion, anger, resentment, and affection he felt for him. Brett is able to offer a fuller perspective on who his father was as he also begins to relate it to the relationship with his own children. The book never feels mawkish or salacious, yet Brett is able to imbue his story with a lot of depth and emotion such that it remains a page turner throughout. His writing style is, as would be expected given his songs, rather florid and grandiose, but somehow it never detracts from what he's trying to say. It in fact is the perfect voice with which to tell his story and now that I've finished the book, I couldn't see him writing it in any other way. The one critique I do have is that he does still have the slight tendency to slip into some of his comfortable cliches. As anyone who is familiar with Suede's music circa, let's say 1997-2002 (and even some of their more recent work), Brett has a fair number of pet phrases and subjects that continually pop up in his lyrics. Therefore, I had to suppress a chuckle when for instance he used the phrase "pebble-dashed" twice within the first dozen pages of the book. The repeated uses of the title phrase throughout the book seemed a tiny bit forced and there were plenty of references to Brett's love of exploring the more downtrodden, grimier, seedier, less glamorous aspects of life in his art, but the slight lack of restraint in reining in these cliches is also part of the book's charm, at least if you're a Suede fan. There are also several subtle swipes at his perpetual nemesis Damon Albarn and Blur...never explicitly named but obviously the recipient(s) of more than a few digs (which, as big a fan of Blur as I am, I can honestly say are mostly warranted). Coal Black Mornings is to the Suede story what Morrissey's memoir is to the Smiths story, only less bizarre, less bitter, and more readable. The single-minded and minimalist presentation of the book, from the text to the lack of images, immediately brought Moz's book to mind. But whereas I didn't really enjoy Morrissey's book and can't see myself reading it again any time soon, I feel quite the opposite about Coal Black Mornings. There's a warmth and real heart to it that is indescribable but obvious. It's one of the most unique and enjoyable musician memoirs I've read in a while and for any music fan, and especially a fan of Suede or 1990s British rock music, an essential read. I'm so glad it's Friday because these late night games really do a number after a few days. I managed to watch the first inning before succumbing to sleep, but I did see Mookie hit his second leadoff home run of this series. Just incredible. He's really mashing right now and if he keeps it up, I see a repeat of his stellar near-MVP 2016 season unfolding. He's already well on his way. The Angels actually managed to tie the game at one in the bottom of the second, but as has been usual this season, the Red Sox pulled away by scoring two in the fourth off the bats of Rafael Devers and JD Martinez. Former Red Sox outfielder Chris Young hit a solo homer to bring the Angels within a run, but the Sox would tack on five more runs before the game was over, including three RBI from Andrew Benintendi (one of which was a solo home run), another RBI from Devers, and an RBI from Mitch Moreland. When all was said and done, the relentless Red Sox attack propelled them to a series sweep and their seventh straight win with a final score of 8-2. It seems like every game there's one or two guys who are hot with the bat, and then the next game someone who may have been slumping a bit steps up and has a hot stretch. They all pick each other up and together, it makes for a very dangerous offense. As for the pitching, the Sox got six innings from Eduardo Rodriguez and then three innings of one-hit ball from the bullpen to close it out. With Drew Pomeranz coming back to make his first start of the season Friday against Oakland, this Red Sox rotation looks to only get stronger as the season progresses. Except for David Price's disaster against the Yankees last week, all of the starters have gone at least through six innings in their starts and have pitched extremely well. With their record now 16-2, the Sox have the best start in team history. At this point, I'm not going to worry about setting records or how many wins they finish the season with...I'm just going to enjoy the ride. I do think they should be able to pad that record and extend their streak with this next series against the dreadful A's, though I hope I didn't just jinx them now! These late games are a killer! I coached my youngest daughter's team last night after work and by the time I sat down to watch the game, I only managed to make it partway through the second inning. What I did see was very encouraging, though. In the top of the first, the Sox managed to push a run across on Mitch Moreland's RBI double and they had runners on second and third before Rafael Devers popped up to end the inning. They were definitely getting to Angels starter Tyler Skaggs, who really labored throwing almost forty pitches in the first inning. In the bottom of the inning, LA loaded the bases with one out, but Rick Porcello got two huge strikeouts to get out of it unscathed. Looking at the box score, it looks like I should've toughed it out until the third inning like I did the night before because the Sox exploded for five runs, including a grand slam by Devers. Yet another Sox rout was on and there were two more homers: a solo shot from JD Martinez in the seventh and a two-run homer from Moreland in the ninth. The Angels never threatened and the Sox won 9-0 for their sixth straight win. This victory pushed the Sox record to 15-2 and this team is absolutely firing on all cylinders right now. Alex Cora has the team prepared, relaxed, playing hard, staying loose, and having fun and it's showing up on the field every night. After the first week of the season, all anyone said was the Red Sox hadn't played any "real" teams yet. Well, they've now taken two of three from the Yankees and two straight on the road against the Angels (who were playing great ball heading into this series). They've knocked the Angels starters out of the game after two and four innings, and they've worn out the LA bullpen. They're winning with dominant pitching, relentless and clutch hitting, and excellent defense. Cora has pushed all the right buttons and seems to put the right lineup out for every game. Case in point, last night was a scheduled night off for Andrew Benintendi, so the lineup included Martinez in left field (*cringe*), Mitch Moreland at first base, Hanley Ramirez at DH, and Tzu-Wei Lin at shortstop. When I saw the lineup before the game, I thought it was a strange one and that we'd suffer from a bit of a dip at the plate and on defense. So what did they do? They dominated the game from the first pitch to the last. This Red Sox team is clicking and storming through their competition in a way I haven't seen in a long time, if ever. They're one bad inning from the bullpen and one bad inning from David Price from being undefeated. Even the fantastic teams of 2003, 2004, 2007 and 2013 were slow out of the gate (as the Red Sox traditionally are). This is unlike anything I can remember and I've been watching this game and this team religiously for over thirty years. While it's a certainty that they'll lose upwards of fifty games as that's what even the best baseball teams do over the course of the marathon MLB season, right now it doesn't look like there's going to be an extended swoon any time soon. I know it's early and there are still 145 games left to play, but I wouldn't be surprised if this team made a run at 100 wins this season. At this point, I'll be disappointed if they don't! David Price started the game for the Sox and while he wasn't sharp, he was more than adequate, going five innings and only giving up a single run. He struck out six but he also walked four. He's much too talented to continue giving mediocre performances like this so I hope it's just a case of needing to get into a groove early in the season. Love him or hate him, if the Red Sox are going to make a run at the World Series, they're going to need everyone to contribute and perhaps none more so than Price. I'm now looking forward to seeing if Rick Porcello can keep up his redemption tour tonight, although once again I'm sure I won't be able to watch more than a few innings. While I've always enjoyed staying up late to watch west coast games, whether they're baseball or basketball, it's just not doable to watch entire games when I've got to be up early the next morning. With a series in Oakland following this Angels series, I'll do the best I can over the next week and hope I can catch up on my sleep next week. On a day that felt more like football weather than baseball weather, the Sox got their third straight win against the hapless O's and clinched another series victory. I wasn't able to watch more than an inning of the game...we had a birthday in the family to celebrate and then some practices. Also, I spent most of my available time watching the Celtics opening playoff game and following the Sox on my phone. In any event, it was nice to see another win even if the conditions at the ballpark were atrocious. Chris Sale picked up another no decision and while he wasn't particularly sharp due to the cold weather, he didn't need to be. He gave up one run and struck out eight in five innings and the Sox were down 1-0 when he exited. The team would pick up a run in the bottom of the fifth to tie it up and another two in the sixth to take the lead. That would be enough for a 3-1 win. Andrew Benintendi had a 3-4 day including a triple in the fifth to tie the game. Backup infielder Tzu-Wei Lin went 2-4 with an RBI, and JD Martinez took advantage of a wild pitch to score the Red Sox other run. While it was a bit of an ugly game due to the weather, a win is a win and the Sox now have the league's best record at 13-2. Almost immediately after the game ended, it was announced that the annual Patriot's Day game on Marathon Monday (today, April 16) would be postponed until May 17 due to the inclement weather. While it's understandable given how miserable it's been in April, I confess to being a bit sad that the game won't be played this year. While the players have over the years made their distaste for such an early start known, I've always loved listening to the 11am game while at school or work and then following the marathon results. It just won't feel the same although I'm glad the team will have an off day in order to rest before starting a series in Anaheim against the Angels tomorrow night. LA has been much better than expected this year: Mike Trout (my favorite non-Red Sox player) is always going to be Mike Trout, but their key offseason pick-ups have performed well for them so far, none more so than Japanese rookie Shoehi Ohtani. The Sox weren't originally scheduled to face Ohtani, but he missed his last start against Kansas City for weather-related reasons so they'll face him in the series opener. While west coast games are always tough to watch during the work week due to the 10pm start times, I'm going to do my best to watch this series, and especially Ohtani's start. It should be a fun match-up of two strong teams and another measuring stick for how good these Red Sox really are. The first of three straight afternoon games for Sox was this second game of the series against the O's. I spent a relaxing day at home doing chores around the house so I had the game on the TV and mainly listened to it from the other room, popping my head around the corner every few minutes to check out the action (or when I heard the crowd cheer in excitement). I was able to watch the first five innings before heading out to take my kids to the cages to get some work in before our games and practices tomorrow. The Red Sox started Hector Velazquez again and he again turned in a solid, workmanlike performance, going five innings and striking out five while giving up two runs. The Sox bats got to Baltimore starter Alex Cobb early, tagging him for eight runs in less than four innings. There was a scary moment early in the game when Mookie hurt his foot on a slide into home...he'd eventually leave the game and was replaced by Blake Swihart. Blake swung the bat well, going 2-3, and Andrew Benintendi and JD Martinez also had good days at the plate. Hanley Ramirez came back after getting struck on the hand Thursday and had a pair of hits including a home run over the Green Monster. The rout was on and the Sox cruised to the victory 10-3. With their 12-2 start, the Sox are off to the best start in franchise history. The scary thing when I think about it is that they're one bad inning from the bullpen and one bad inning from David Price away from being 14-0. They're playing extremely well in all three phases of the game and are more fun to watch in just these first fourteen games than they were all season each of the last two years. I hate to keep harping on it, but seeing as it's mainly the same group of players since 2016 with the only change being the manager, I have to think a huge part of it is down to Alex Cora. I have several friends who swore they wouldn't watch much of the Sox this season because of how much they disliked last year's team...I hope they change their minds and give this team a chance because the fun is most definitely back. The season is still early and while the Sox are red hot, there are always tough stretches during the long season. I don't necessarily expect them to keep up this torrid pace for the next six months. Still, I have a feeling they're going to be a much tougher out in the playoffs than they have been the previous two years. Division rival Baltimore visited Fenway Park for the first time tonight to open a three game set. I had to coach my son's rec team tonight and then I took my oldest daughter to the cages to get some swings in, so I only managed to watch the last half of the game before watching highlights from the first few innings. The Orioles have been pesky over the last few seasons although coming into 2018 they look to be on the downward slope and not in contention. Every game against the O's in recent years irritates the hell out of me for a variety of reasons: I hate the way they play the game with their home run or bust approach to hitting and manager Buck Showalter is one of the most arrogant and smug guys in the game. Every time I watch the O's, he acts like he invented baseball which I find amusing considering the guy hasn't ever won anything as a manager. Anyway, tonight the Sox had Eduardo Rodriguez on the mound and he pitched six innings, striking out eight and only giving up a single run in the first. He's been one of those guys over the last few seasons who can look really great but can never put it together over the course of an entire season. Whether it's down to consistency or injuries, he's been very up and down. I'm hoping this is the year he can take the next step because he certainly has all the talent to make it happen. Offensively, the Sox got on the board early with four in the first, capped off by a 3-run homer from Eduardo Nunez. The O's got a couple back in the seventh, but the Sox easily kept them at bay and finished off the victory, 7-3. The bats stayed hot, especially Nunez, JD Martinez, and Rafael Devers, and once again the pitching was excellent. The Sox have three more games on this homestand against Baltimore before they head to the west coast to take on the Angels (who are playing very well). This 11-2 start has been great to watch, especially because even in years in which they have great teams the Sox tend to start slow. Their red-hot start is something we haven't seen from this team in a while and while the talent level isn't much higher than it's already been over the last few seasons, it's very noticeable that the culture around the team is much better. I have to believe a huge part of that is due to Alex Cora. In any event, it's made for some of the most entertaining early season baseball I can remember in a long time. Two out of three ain't bad. Especially when it means the Red Sox have taken the first series of the season from the Yankees. I was coaching my son's travel team tonight so missed the first three innings, checking in regularly with the updates on my phone before getting home to turn the game on. I was greeted by a 6-0 Red Sox lead which, after the previous night, made me very happy. Rick Porcello in his third start of the season looks to have reverted to his 2016 Cy Young-winning form, leaving last season's debacle behind. By the time of the 45 minute rain delay after the fifth inning, he had a no-hitter going. It was eventually broken up by Aaron Judge who hit a double in the seventh. When he left the game after the seventh, Porcello had given up just two hits and struck out six...another great outing and the polar opposite of David Price the night before. The only bit of drama came later in the top of the ninth when Marcus Walden had a brutal outing, loading the bases and giving up a 3-RBI double to Gary Sanchez to let the Yankees on the board. Craig Kimbrel, who didn't expect to pitch given that there was a six run lead in the ninth, had to come in and get the save. Luckily, he made quick work of the Yankees, getting three outs (striking the last two). With that, the Sox took the series and got their tenth win on the young season with a final score of 6-3. There was a scary moment in the first when Hanley Ramirez was hit on the hand by a pitch and had to leave the game. His X-Rays came back negative which is good, but it looks like we'll be seeing more of Mitch Moreland at first base for the time being. That's fine with me...in addition to a 2-3 night at the plate, he played some of his usual stellar defense in the field. It's also nice to see Jackie Bradley heating up with the bat...he had a nice night and overall had a good series. If everyone starts to bash going forward this team is going to be scary, especially with how dominant the pitching has been. Things got interesting when Yankees rookie Tyler Austin spiked Brock Holt while sliding into second base. Both benches and bullpens cleared and there was a lot of standing around and shouting, but they got back down to business. After going down 8-1, the Sox made it interesting by scoring five runs in the fifth inning capped off by a JD Martinez grand slam. However, the Sox coughed two runs back up in the sixth to make any talk of a comeback that much more difficult. It was the seventh inning when this great rivalry heated up again: Joe Kelly threw inside at Tyler Austin and then, two pitches later, drilled him in the back with a 98 mph fastball. Austin slammed his bat and helmet down, charged the mound, and the benches and bullpens emptied in a classic Sox/Yankees brawl. Kelly took Austin down and got some good licks in to the back of Austin's head before the behemoth Aaron Judge pulled Kelly up and pushed him over to the Sox dugout to try and diffuse the situation. Austin charged the pile and took a wild swing, connecting with a Red Sox bench coach. Expect suspensions for Kelly and (especially) Austin. A lot of people talk about how much they think baseball's unwritten rules are stupid and how they dislike the way the game polices itself, but I personally love it. It's been this way for 100+ years and it's part of baseball culture. The Sox made things interesting in the bottom of the ninth when they got two quick hits off of Yankees closer Aroldis Chapman and scored on a passed ball. However, Sandy Leon, Mookie Betts, and Rafael Devers went down in quick succession to end the game in a 10-7 Yankees win, ending the Red Sox winning streak at nine games. As bad as the Yankees looked in the first game, their bats came alive in this one. Gary Sanchez clubbed two 2-run home runs and while Stanton still flailed away and looked like he was pressing, he did look more comfortable tonight. The Sox swung the bats well...it was the pitching, and in particular David Price, that lost this one. Hopefully Rick Porcello can right the ship tonight and the Sox can take the series. It doesn't matter whether it's April, July, or October...nothing beats Red Sox/Yankees! It's only the third week of the season and there's already a series with the Yankees...you can't beat that! Coming in to the game, the Sox were winners of eight straight and in first place while the Yankees had been up and down and sported a 5-5 record. I had looked forward to this series all weekend, figuring they would be tightly contested games. As I sat down on the coach with my two oldest daughters to watch, I told them that I wouldn't be surprised if the Yankees managed to steal two out of three because I didn't think they were as bad as they've looked so far. After last night's blowout 14-1 Red Sox win, now I'm not so sure the Sox won't sweep! Things got off to a good start in the bottom of the first when the Red Sox scored a run, although after that they had bases loaded with one out and failed to score any more. However, in the second inning they tacked on another three runs, punctuated by a 2-RBI triple from Andrew Benintendi. Hanley Ramirez drove in another run via sacrifice fly in the fourth inning to give the Sox a 5-0 lead. Apart from an absolute moonshot to dead centerfield from Aaron Judge in the fifth, the Yankees couldn't get anything going all night. Stanton in particular looked pretty bad, flailing away and striking out a couple of times early in the game. The Sox blew the game completely open in the sixth, scoring nine runs. JD Martinez missed a grand slam by only a couple of feet and had to settle for a 2-RBI double. After loaded the bases again, the exclamation point was provided by Mookie Betts who launched a grand slam into the Green Monster. Right before he came to bat, I turned to my daughters and said "if he can hit one out right now, that place will explode." Sure enough, he did...and it did! Mookie had a great game, going 4-4 with two doubles and 4 RBI. Cora wisely pulled Sale after six innings...no need for him to be in there with a thirteen run lead. The bullpen mopped up the Yankees and that was it. Nine straight wins and humiliating the Yankees? I'll take it! More than the great start to the series against New York, I loved how the Sox played last night. Aggressive at the plate, aggressive (but smart) on the basepaths, and they seemed to be very loose and having a lot of fun. The Yankees, by contrast, seemed tight and like they were pressing (especially Stanton). It'll be interesting to see how both teams come out tonight and whether the momentum they had going in opposite directions last night carries over tonight. What a comeback! I didn't get to watch a single minute of this game because I was coaching my son's travel team in a doubleheader, but I followed the updates on my phone and watched highlights when I got home. After falling behind early, including a five run hole, the Red Sox managed to come back from a 7-2 deficit and scored six in the bottom of the eighth to capture their eighth straight win, 8-7. However, the game wasn't without some bad news as Xander Bogaerts left the game with an ankle injury after trying to corral an errant JD Martinez throw that almost ended up in the dugout. If Xander is out for an extended period of time, it will be a big blow to the Sox. Brock Holt and Tzu-Wei Lin are serviceable utility infielders, but not two guys you want to get extended time if it can be avoided (especially with their bats). I do have to say that while I know it's early, I haven't been overly impressed with Martinez so far. His hitting has been inconsistent and the power has been non-existent. Judging by his atrocious throw which inadvertently caused Xander's injury, his defense is as much of a liability as I thought it would be when the Sox signed him. I didn't understand the logic of wanting him to play in the outfield when we have one of the best defensive outfields in the league with Benintendi, Bradley, and Betts. My hope was that JD would play almost exclusively DH, but for whatever reason Alex Cora and Dave Dombrowski want Martinez to get a significant amount of outfield time. I'm hoping that yesterday will have them rethinking that (and also hoping that Xander recovers quickly!). In the meantime, that's eight wins in a row for the Sox and a day off before a series with the Yankees starts tomorrow. With the Sox on a roll and the Yankees scuffling, it'll hopefully be a good one! Wow, what an explosion of runs today! A chilly Saturday afternoon game started with Red Sox pitcher Rick Porcello continuing in 2018 what haunted him in 2017 by giving up early runs, surrendering a 2 RBI double to Brad Miller in the top of the first. This time, the Sox would get those runs back in the bottom of the inning, punctuated by a scorching wall-ball double by Xander Bogaerts to drive in two. By the end of the first, it was 4-2 Red Sox and the rout was on. Xander continued his red-hot game (and season) by crushing a grand slam in the bottom of the second. Porcello settled down and went seven and a third strong innings, striking out seven while giving up just one more run in the eighth. JD Martinez hit his first home run as a member of the Red Sox, a solo shot in the seventh, and Rafael Devers added a solo home run that inning too. Marcus Walden got the save and the Red Sox won 10-3. Discounting the competition the Sox have faced so far, it was nice to see a blowout win today, and even better were the home runs. The Sox were dead last in home runs in the American League last season (and close to the bottom in the entire league overall), so to see them hit three today bodes well. Hopefully as the weather warms up, the bats get hotter and stay hot. Xander has kept his torrid start going and I'm hoping this is the year he finally puts it all together for an entire season. The pitching has continued to be a strength (apart from the middle relief) and the defense hasn't committed an error yet this season. All in all, this is already feeling like a different Red Sox team from the manager on down and I like it. Finally, the home opener for the Sox although typical for a game at Fenway in early April, it's cold! Forty degrees and windy isn't baseball weather, but you can't fight Mother Nature. It's strange to see the Rays again so soon this early in the season, but a quick glance at the April schedule shows it to be a weird one anyway. The home opener today, a day off tomorrow (after a day off yesterday) before continuing the series on Saturday and then another day off Monday...very odd. David Price once again pitched great and looks very intent on atoning for his atrocious 2017 season both with his performance and his attitude. He had another strong outing, going seven innings and giving up three hits and no runs. However, the infuriating tendency for the Red Sox to run into outs on the basepaths in 2017 appears to be alive and well during this young 2018 season. Andrew Benintendi had a bad performance on the bases that erased what could have been the Red Sox first run early in the game. It was scoreless until the eighth when Carson Smith (surprise, surprise) gave up a two-run home run to Matt Duffy to give Tampa a 2-0 lead. However, the Red Sox made a thrilling comeback in the bottom of the ninth when they scored two to tie the game. Then, with the bases loaded and two outs it looked like Jackie Bradley was going to win the game when he legged out a chopper to first. The initial call on the field was that he was out, but replay clearly showed his foot was on the bag before the ball was fully in first baseman Brad Miller's glove. However, the replay officials saw differently and upheld the call (to a chorus of boo's from the Fenway crowd) and the game went into extras. Finally, in the bottom of the twelfth inning, Hanley Ramirez hit a long single with the bases loaded to drive in the winning run. Red Sox won 3-2, and the winning streak is now up to six games. While I know that the competition they've faced so far hasn't been the most impressive, I am impressed with the different ways in which the Red Sox have managed to win. They've seemed much more focused and relaxed during these games than at any point during last season, and I attribute this to Alex Cora, who is a complete 180 from John Farrell in terms of personality and baseball acumen. They've had the talent the last few seasons, but the mental approach has been severely lacking. That seems to have changed in this young season. While the Rays and Marlins are lousy teams, these are the games that good teams win to pad their records and that's exactly what the Sox are doing. Once this series is over on Sunday, I'm really looking forward to seeing how we stack up to the Yankees when they come to town on Tuesday. It should be a great series! Well, we've now gotten the first extra inning game of the season out of the way. This was a long one! Other than giving up an RBI double to Justin Bour, Chris Sale pitched pretty well for the Sox. Not as dominant as Opening Day, but he was solid through five and struck out six. JD Martinez drove in a run late in the game and the Sox and Marlins ended the ninth inning tied at one run apiece. It looked like the Sox would finally take the win in the eleventh: Eduardo Nunez hit a double and Andrew Benintendi drove him in to give the Sox a 2-1 lead. However, Matt Barnes came on to get the save and after getting the first two outs, proceeded to walk the next two batters (both on full counts) before giving up a double. The tying run scored, but luckily Bour tried to score from second and was easily gunned down by Benintendi. The Sox did turn a nice relay throw, but if Bour wasn't carrying that piano on his back this game would've been over then and there. Instead, in the thirteenth inning Hanley Ramirez hit a two RBI double to give the Sox the 4-2 lead and that would be the final score. The Sox pitching continued to be great (Barnes' blown save in the eleventh excepted). Bobby Poyner, Joe Kelly, Carson Smith, and Craig Kimbrel all performed well and Heath Hembree (who usually gives me heartburn) pitched well and got the save. The offense came up with the timely hits, but most impressive was the defense. There was some great play in the field with Jackie Bradley in particular turning in a highlight reel diving catch midway through the game. All in all, a satisfying win even if the Marlins aren't that good of a team. That's five in a row for the Red Sox and they remain alone atop the division. If I may add one more thing, this series and the preceding one with the Rays reaffirmed what I've thought for years: professional baseball (and pro sports in general) in Florida are a joke. The crowds are pathetic and those who do show up tend to root more numerously and vocally for the road teams. This is because places like Florida (and Arizona, to name another) are full of transplants who bring their allegiances with them and vastly outnumber the insignificant contingent of home fans. The two Florida teams (and Arizona) have been in existence over twenty years and this still hasn't changed. If it were up to me, I'd move Tampa ton Montreal and contract the other two teams, but that's a discussion for another (longer) post. In the meantime, the Sox now get a day off before traveling back to Boston to open the home season at Fenway Park in two days. Hopefully the weather will cooperate more than it did for the Yankees and Mets earlier this week! I was able to watch the first couple of innings of this game before I took my oldest daughter to the batting cages to get some practice in. I saw Brian Johnson give up a solo home run but when I left the house, the Sox had two men on and were threatening. When we got back, I managed to watch the last couple of innings and there was one thing above all else that made me happy once the game was over: the offense! Finally, some signs of life and power. Mookie had another good game, Andrew Benintendi finally got a hit, and pretty much everyone else (except for Jackie Bradley) contributed. There were even a couple of home runs, from Mookie and Hanley Ramirez, which were nice to see since the Sox had only hit a total of two on the season prior to this game (and one of those was a flukey inside-the-park homer). As has been the theme so far this young season, the pitching has been great. Johnson went six innings and struck out five, while Marcus Walden earned his first career save. Even Heath Hembree, who has made me nervous every time he steps on the mound the last few seasons, was solid in his inning of middle relief. Red Sox win, 7-3, and they did it with their living legend David Ortiz watching from the stands, sitting next to former two former Yankees rivals in Jorge Posada and Marlins minority owner and Yankees legend Derek Jeter. Four wins in a row on the young season where they really should be undefeated (Opening Day still bothers me!). Granted, they've played two bad teams in Tampa and Miami (and don't get me started on pro baseball in Florida...that's a whole other article I need to write some day), but wins are wins. That being said, I want to see how the Sox match up against some better competition as the season progresses. When the legendary band Traffic is discussed, the first names that always come to mind are Steve Winwood and Jim Capaldi. This isn't surprising as the duo founded the band, Winwood has been one of the most respected and talented musicians of the last fifty years, and he and Capaldi wrote almost all of Traffic's material. Dave Mason, another co-founder, is well known to serious music fans for his work in Traffic, his session work, and as a solo artist in the 1970s. It's the fourth co-founder of Traffic, Chris Wood, who is sadly the forgotten man when it comes to discussing both Traffic and 1960s/early 1970s music. 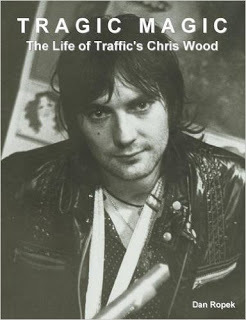 The most enigmatic member of one of the most enigmatic bands to emerge from the 1960s England, Tragic Magic is not only the first ever biography of Chris Wood, but it also serves as the definitive story of Traffic. Author Dan Ropek spent ten years researching and writing Tragic Magic, getting cooperation and firsthand accounts from those closest to Chris Wood. These include his Traffic bandmates Jim Capaldi, Steve Winwood, Dave Mason, David Hood, Roger Hawkins, as well as numerous friends, family members, former classmates, and other musicians he interacted with during his life. Starting with his comfortably middle-class childhood and upbringing in Birmingham, England, Ropek traces the evolution of Chris' personality, his interests in mysticism and the occult, and his budding talents for art and music. Eschewing pop music and rock and roll in favor of blues, R&B, and especially jazz, Chris trod the path less taken by his contemporaries. While nearly every musically inclined young man his age was picking up a guitar, bass, pair of drumsticks, or sitting down at a piano, Chris instead taught himself to play flute and saxophone. Inspired by the birds he loved to watch and the sounds of nature he loved listening to, his style was predicated less on technical proficiency and more on feel and mood. This was a unique inflection to his sound that would be both his blessing and his curse. Combined with his lifelong crippling stage fright and insecurities, Chris was a very complex and introverted person. Nonetheless, nearly everyone who befriended him looked back on him in the book with fondness and warm thoughts. While serious about his music, Chris was first and foremost a very talented artist, so much so that he followed the tradition of numerous great 1960s British bands by attending art college. The Beatles, Rolling Stones, Kinks, Who, and Cream all had members who went to art college and with Chris, so too did Traffic. While very promising and remembered by all as very talented and expressive, the small gigs and jams he played on the side became too tempting and, not without serious trepidation, he decided to leave school to pursue a career as a musician. This was no doubt helped along by his budding friendship with fellow Birmingham musician (and then current teen aged musical prodigy) Steve Winwood. From here, Ropek does a fantastic job detailing how Wood and Winwood developed their friendship and musical sympathy and came into the orbit of two more local musicians, Jim Capaldi and Dave Mason. Finally feeling the time was right to leave the Spencer Davis Group, Winwood made a leap of faith to start a new band with three unknowns and Traffic were born. At this point, the book becomes as much a full-fledged Traffic biography as it does a biography of Chris Wood. Tracing the history of the band from their first jam sessions The Elbow Room to a remote Berkshire cottage and their first single releases, it became clear almost from the beginning that Mason was an awkward fit, both personality-wise and musically. What was also clear from the beginning was that, while Winwood, Capaldi, and Wood had a synergy and musical connection between them that was undeniable, Chris would soon be unintentionally frozen out of the songwriting partnership by the end of their first year together. While he would continue to contribute to songs throughout his career to varying degrees, the lack of songwriting credits, especially where he thought they were warranted, would cause alternate bouts of silent resentment and depression. One thing that was clear from everyone who knew Chris was how unsuited they thought he was for the rock and roll lifestyle. While there was great success both commercially and artistically during his time in Traffic, his perpetual emotional and personal insecurities combined with his generally fun-loving nature led him down the path of drug and alcohol addiction that would eventually kill him. Along the way, he had the misfortune to fall head over heels in love with perhaps the worst woman for him (in terms of temperament) in Jeanette Jacobs. While they were a couple from the late 1960s until their split in the late 1970s, they remained legally married until her death in 1982. Their marriage and relationship was anything but healthy or normal. Joining Chris in his addictions and serially unfaithful to him, he was none the less head over heels in love with her and would remain so for the rest of her life regardless of the torment it caused him. Combined with his already fragile psyche, this anguish would have devastating effects on not only his career, but his health and ultimately his life. While the details of the entirety of Chris' life and music are fascinating to read, they're especially so when reading of his time in Traffic between its founding in 1967 and their dissolution in late 1974. Throughout the whole book, though, one thing becomes clear: for reasons not even necessarily known to him, Chris Wood was a very troubled, unhappy person for most of his adult life. Musically, his hard line to eschew commerciality for the purity of his art was a fine line he was only able to just straddle during Traffic's success. However, this rigidity combined with his insecurity hamstrung his career after the band split up, and to crippling effect. Detailing all of this, Ropek manages to do a fine job being honest about Chris' virtues and flaws while sounding neither hagiographic nor salacious. Bolstered by his unprecedented access to numerous people in the inner Traffic circle and Chris' family and friends, he weaves the varying strands of Wood's life into a story that is, unfortunately, an almost uniformally sad and depressing one punctuated only with short periods of happiness and success. Much of the book seems to be geared toward rehabilitating Chris' image and legacy in the eyes of music fans and writers. While it does a good job doing this, there were certain points where the author seemed to be trying perhaps a little too hard and overreaching, at least in my view. While I personally gained a better understanding of where Chris was coming from in his approach to music, I still tend to think he was musically and technically limited and the weakest musician within Traffic. That being said, his contributions to many of their songs are wonderful and they certainly wouldn't have had their sound had he not been a part of the group. The book takes on a heavy air of foreboding once Traffic breaks up and it was equally sad and chilling to read of Chris being not only resigned to his fate, but his almost full scale acquiescence to it. The harrowing depictions of his final years from friends and family members lent the final quarter of the book an air of impending doom; even though we already know how the story ends, it's a grim tale to read. What was most shocking to me was how he died; I had always read that it was from pneumonia, but how he got to that point and what actually killed him was not a pleasant journey to read about. Given that Wood was only a year older when he died than I am at present made it even more poignant to me. Tragic Magic is an essential book as it really is the only definitive (and quasi-authorized) biography of Traffic. While it is in many aspects a somewhat somber read, I do want to emphasize that overall it's more a celebration of Chris' life and music, especially as the publication of the book led to the release of the excellent archival releases of music Chris made (but never released) after Traffic. This included his lost album Moonchild Vulcan as well as the Evening Blue box set. If you're a fan of Traffic, this book is a must-read. There was so much new information I learned that I'm already planning to re-read it in the near future as there's almost certainly a lot I'll forget. Irrespective of the subject, this is one of the best-written and researched music biographies I've read. The fact that it finally pulls back the curtain on one of the most enigmatic bands of its day only enhances its standing. After dealing with the driving and lousy weather at my daughter's softball tournament the day before, I enjoyed the day yesterday relaxing on the couch watching the Sox close out the series with the Rays. The Sox had Hector Velazquez starting on the mound, who I actually saw him up close this past summer when he pitched for the Pawtucket Red Sox here against the Indianapolis Indians. He was pretty good at that game and was solid in the few starts he made with Boston toward the end of last summer, so I was interested to see how he'd do. After a shaky start and giving up a solo home run to Tampa's Brad Miller, he settled down and pitched great. He got more aggressive in the strike zone as the game went on and gave the team six solid innings. The middle relief was good, too; when Matt Barnes is pitching well, he's tough. The coolest story of the day was Sox reliever Marcus Walden, who was making his Major League debut at age 29! He got the final out of the fifth inning and pitched a 1-2-3 inning in the sixth. I can only imagine how exciting that must've been for him. The scariest part of the game came when Alex Core put Joe Kelly in to close the game in the ninth. Leading 2-1, Joe made it interesting by giving up two hits but he was able to strike two out and earn the save as he secured the victory, 2-1. Still, I hope Joe closing out a one run game isn't something we see too often this season. While a three game winning streak this early in the season is nice, as is the Red Sox now being alone in first place in the division, I'm still concerned about the offense. It's been almost non-existent in this series and the team has carried over their troubling trend from 2017 of stranding a lot of runners on base. Mookie Betts broke out and went 2-3 (and was also hit by two pitches), Rafael Devers and JD Martinez each drove in a run, and Jackie Bradley finally got his first hit of the season, but otherwise the bats were very quiet. While it's always nice to win close games (and the Sox have won each of the last three by one run), it's not something that's sustainable over the course of a long season. It's especially troubling because quite frankly, the Rays are not a very good team. I'm hoping the offense picks up and they can convert more scoring chances as the season develops because the other contenders in the American League like the Yankees, Astros, and Indians are far superior (especially on offense) to the likes of the Rays and will be difficult to catch if we fall behind them in the standings. The Sox start a new series with another bad team (Miami) tonight, so I'm hopeful they can make some hay and get a few more easy wins before heading to Fenway to open the home season next week.